These narratives and other documents deserve to be shared. Enjoy them, and let me know if you have anything to contribute. Ultimately, I would prefer to see information on a deceased person in one place on the Internet, rather than bits and pieces scattered among many "private" family trees on ancestry.com and numerous similar sites. These sites are questionable sources of data because they rarely cite their sources, and they may contain incorrect or incomplete "facts." The WeRelate Wiki has the potential to become such a single collaborative site for these "person pages." I have loaded most of my data related to the Krieger, Moffat, Noack, Renwick, Smith, Summach, Watson, White, Yourt(h) and Zummach families to WeRelate, and will continue to update them as time permits. WeRelate encourages the citation of reliable, publically available sources. You will see my sources and will not have to ask me why I included specific facts or events. Future researchers may find that some of these facts are "wrong," and they can make additions and changes to the page. They can also engage me in an on-line dialogue to resolve such questions using the built-in "Talk" link on every page. WeRelate's database of place names has become a standard repository used by other sites. Take the time to click a place name to learn more about it. It is like a Wikipedia page but is focused on a genealogical point of view, using 1900 as a consistent point of reference. If the name of the place or county or other administrative entity has changed since then, you may see the more "modern" information as additional links on the page. You will find that most of the items below are actually links to WeRelate pages that I have created. This makes them publically available - no one "owns" them. The data is not covered by copyright. WeRelate Wiki WeRelate home page. Mary Lizzie Wells' Letter 1924 This is a transcription of a 1924 letter to Martha Ann Jane (Annie) Sine nee White about the White family in New Zealand. It is posted on the WeRelate Wiki. 60 Years Whites New Plymouth, N.Z. by Eric White Phyllis Sine copied and distributed excerpts from 60 Years Whites of New Plymouth by Eric Hoyland White after her visit to New Zealand in 1959 or 1960. White Family Memoir by E Frank White Sr. Frank White was Grandma Moffat's brother. He lived in Cincinnatti, OH. I have several copies of this memoir including one from Frank White Jr. This link takes you to the WeRelate Wiki where I have posted a full transcription of this memoir. 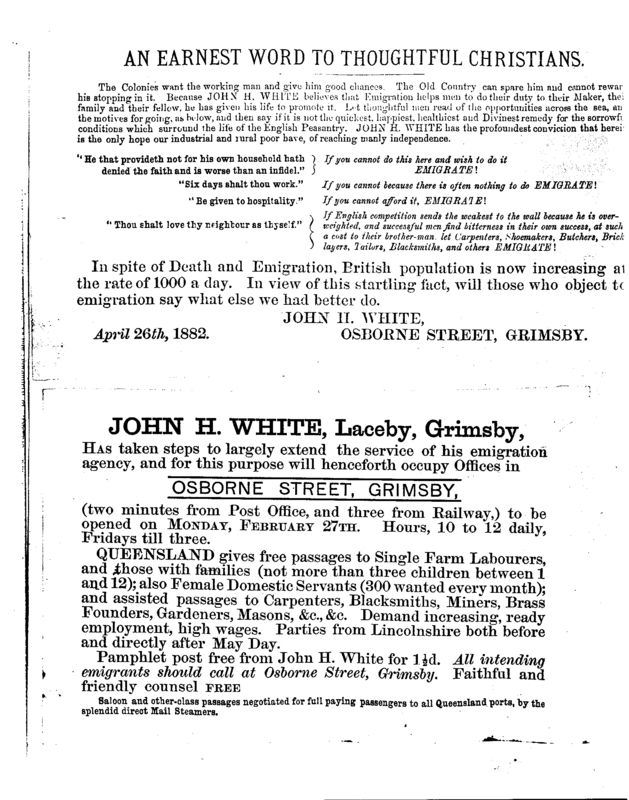 Facsimile Emigration Posters John Hobson White’s posters advertising emigration to New Zealand. There is a chapter about J H White in my book "Farthest Promised Land" by Rollo Arnold. I purchased it from a used book site in New Zealand. A Soldier’s Diary - H.H. White This is a transcription of Granduncle Corporal Bert White’s WWI diary. He served with Canada’s Light Railway Battalion, maintaining narrow gauge railways right up to the front lines. Buster - A True Story By Myrtle Moffat nee White, written in the hopes of having it published in the Western Producer newspaper to earn some extra money. I suspect this was probably during the depression years. Rosenthal School Pals Reunion, July 1, 1931 On Dominion Day (July 1) 1931, a group of friends and relatives originally from the Rosenthal district of Renfrew County, Ontario gathered at the farm of August Summach in the Avondale district of Saskatchewan. Recollections of the trip west by August Summach This was published in a special edition of the Saskatoon StarPhoenix in 1965. 1925 Summach Brothers Threshing Outfit This panoramic photo was taken of the Summach Brothers Threshing Crew. Uncle Harvey Summach provided the identification of the folks in the photo. Grandpa Fred liked to tell the story of the coffin that saved three men after their boat sank. The boat was the Mayflower, and it sank during a run from Barry's Bay, Ontario back to Combermere on Nov 12, 1912 taking 9 lives. Robert Pachal, brother-in-law of Carrie Junop nee Brown was on board, escorting her brother's body (John Herman Brown) back to Ontario for burial. He accidentally shot himself near Yorkton on Nov 7, 1912. It was John's floating coffin that allowed the three Mayflower passengers to survive the icy waters until they got to shore. This story was featured on Ripley's Believe It or Not! More about the Mayflower Penny Taylor includes more information on this linked page. Scroll down to find it.